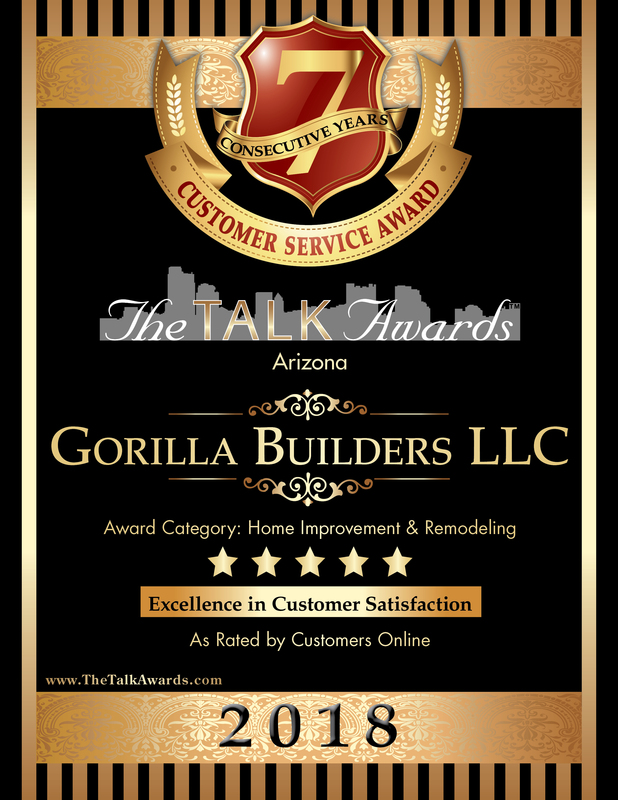 With the highest possible customer satisfaction rating of 5 stars every year since 2012, Gorilla Builders has earned its seventh consecutive prestigious Talk Award. Surprise, Ariz. (March 6, 2018): Gorilla Builders L.L.C. has earned continuous high praise from its satisfied customers, leading to its seventh straight Talk Award. The Talk Awards identifies and honors businesses that provide an outstanding customer experience. Winners are based on The Research Company’s independent, proprietary research and evaluation system, which identifies businesses with a track record of excellent customer service and satisfaction. The rating system combines data collected from nominations, online and other customer reviews, surveys, blogs, social networks, business-rating services, and other honors and accolades — all of which express the voice of the customer. Only those with a 4- or 5-star rating receive The Talk Award. Jeff Suer and the team at Gorilla Builders have been providing general contracting services for residential and commercial customers for more than two decades, earning a reputation as a trusted contractor for new construction and renovation projects. From strip malls and fire stations to luxury homes, custom garages and more, Gorilla Builders has one goal in mind: to provide quality craftsmanship and attention to detail at an affordable price. Gorilla Builders offers an unparalleled level of professionalism rooted in experience and honesty. Furthermore, Suer is involved in every project, ensuring responsiveness, unmatched communication and 100% customer satisfaction. In addition to new construction and renovation projects, Gorilla Builders provides an extensive array of home improvement services including doors, windows, flooring, roofing, electrical, plumbing, fire sprinklers and framing. Gorilla Builders is located in Surprise, Arizona. For more information, call 623-776-9113 or go online to https://gorillabuilders.net. Visit the company’s Award Page at https://www.thetalkawards.com/award/gorilla-builders-llc. The Talk Awards were created by The Research Company to calculate customer satisfaction ratings for a variety of businesses, based on customer feedback online, and help businesses gain control of their image and reputation by providing consumers a fair and unbiased overview of their business. For more information about The Talk Awards, call 866-732-9800 or go online to www.thetalkawards.com.